M.P.F.F.A. | Station 10 Mammoth Rd. from horsedrawn to todays 1993 Spartan/Laverne Engine with a 1500 gpm pump carrying a 750 gallon water tank. 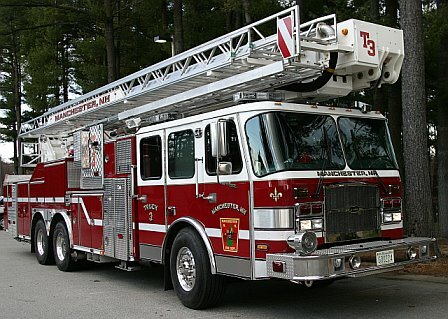 A 1986 E-One aerial platform quint. 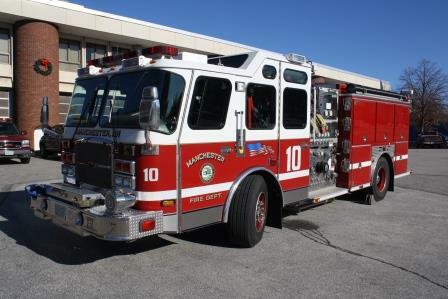 It has a 95 foot aerial ladder, a 1500 gpm pump and carries 300 gallons of water. Despite an Engine and a Ladder Truck being assigned to this station there is only 1 crew of firefighters. They take which ever piece is reqested. The staffing for 1 piece complys with national Staffing Standards leaving the other piece of apparatus with a staff of 0.